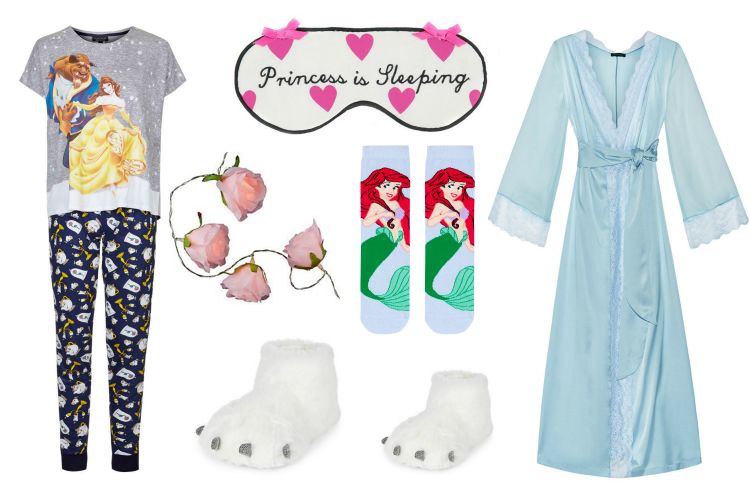 Eye mask, Debenhams; Gown, Myla; Monster booties, New Look; Beauty and the Beast pyjamas, Topshop; Rose twinkle lights, New Look; Ariel Socks, Topshop. Fairytale-themed nightwear is something that is super-duper easy to find these days. Whether we want to go to bed referencing our favourite Disney Princess, or feeling as if we actually ARE one, there's loads of pretty stuff available, both on the high street and from luxury brands. Topshop is always a good place to scout out cartoon pyjamas, as is Primark (obviously) but if you want something more decadent, like this gorgeous Cinderella dressing gown from Myla, but without the hefty price tag, check out Ann Summers, M&S, or H&M. They all have stunning nighties and gowns this winter. To complete the experience, don't forget to work some magic in your room with a garden of rose fairy lights (minus the thorns, obvs).